Prefete Duffaut's Beautiful coffin, detail. Legendary painter Geo Remponeau, who was born in 1916 in Port-au-Prince Haiti, turned 96 on September 16 2012 in New York where he has resided for the past 46 years. At a very early age, Remponeau showed his interest in drawing by depicting an upside down horse. As a teenager, he put his talent to good use and earned pocket money by creating advertising pieces for local businesses. 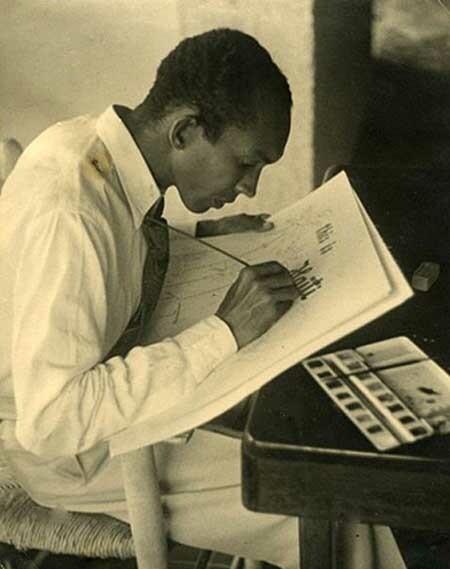 In the 1940's, Remponeau at that time an accomplished artist, became instrumental in the Haitian art movement of the Centre d' Art, an art center that focused on promoting and encouraging artists to get together and paint. Remponeau subsequently became a mentor to many young artists who themselves later on achieved their own success. Post Centre d'Art, Remponeau opened his own studio and gallery where he regularly featured upcoming artists. He was able to support his family by not only selling his paintings but also by teaching art at the University and by promoting images for many businesses in Port-au-Prince. Although not the first Haitian artist, Remponeau's strength lied in his love for his people. He was the first to show Black faces in school books illustrations. His portrayal of people at work revealed an idealized side of the nation: a proud people not afraid of hard work. Furthermore, Remponeau emphasized in a very classic style incredible landscapes, one of his famous one being the majestic cacti proudly erect against the blue mountains of Haiti. He deliciously painted a colorful and fruitful land. Remponeau's work earned him many awards for his achievement in art as well for his contribution to the Haitian community. But his greatest award was his family and 6 children, most of whom inherited his talent for art. In addition, this passion for art resurfaced even among some of his grandchildren. Bon Voyage! Rest in Peace. Congratulations on leading such an exemplary life. On November 19, 2005 A tribute to M. Remponeau was held at the Haitian Embassy In Washington DC. Here are many photos of the event. Photos by Eddie Santos.